The legendary basketball team, the Harlem Globetrotters, is looking to add a new member to their exhibition basketball team and your child is a viable candidate. Athleticism is a necessity and your kiddo is naturally sporty. He was dribbling a ball before he could run so the Globetrotters' daily practices and drills will be a piece of cake for a kid like him. Judging by the trophies and medals that decorate his room, he's an instinctive athlete. Not to mention, he's a total jokester. Much to your chagrin, he's into pranks too. Even though sitting on a whoopie cushion when you least expect it isn't your favorite thing, this his comedic personality strengthens his Globetrotter candidacy. Finally, is your little athlete also a natural performer? If he craves the spotlight then he belongs on the court doing half-court shots with the rest of the illustrious team. Are you positive that your sporty, theatrical, prankster is the perfect Globetrotter applicant? Well, suit him up in this Harlem Globetrotters uniform and chauffer him to the next try-out. He just may go down in history as the youngest member of the team! The ultimate comfortable costume, this tank top and shorts set is lightweight and perfect for kids to wear while running around the neighborhood to collect candy. The elastic waistband shorts are striped and match the included sweatband while the jersey features the team name, logo, and the numeral "1" on front. 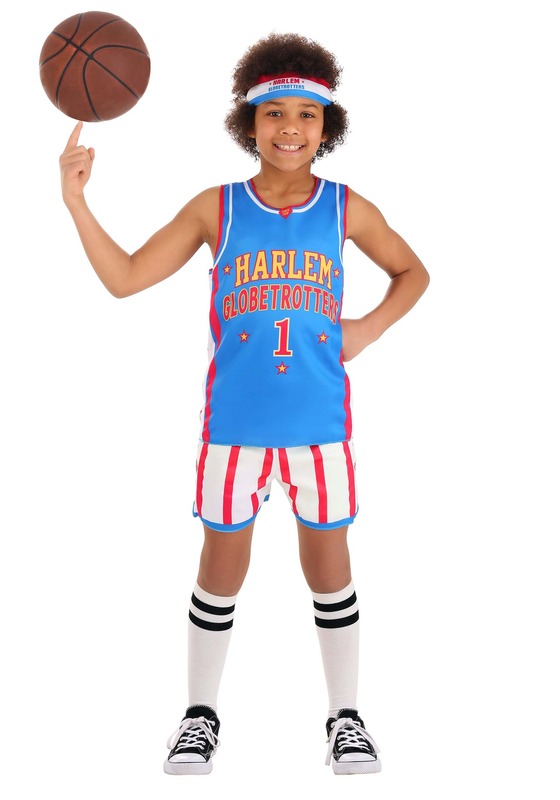 Think of the performances your child will put on for the family once he transforms into a Harlem Globetrotter. He'll forget all about his fidget spinner and he'll call everyone outside so he can show off his (almost) slam dunk he's been practicing. Of curse, he'll be wearing this officially licensed costume while he entertains.